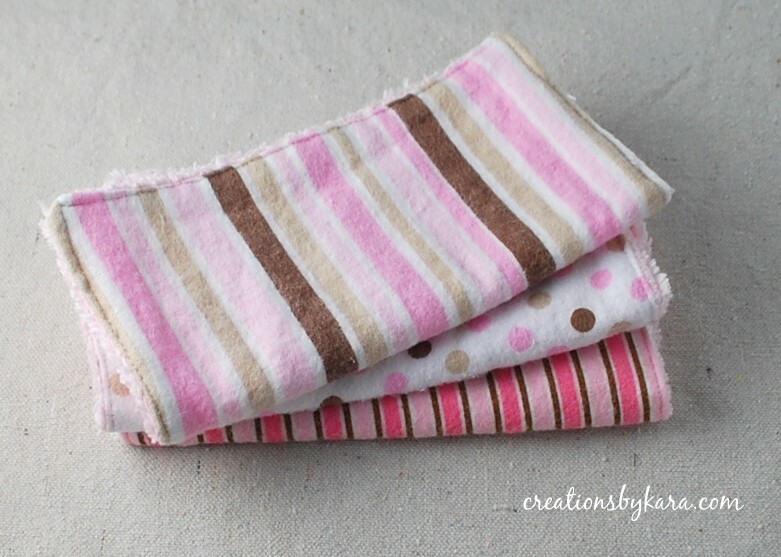 I’m gonna show you how to make handmade baby washcloths. I was never thrilled with the kind from the store, they were always a little on the flimsy side. Plus I thought it would be nice to have a really soft side, and a side that had a little more texture. So I came up with these. 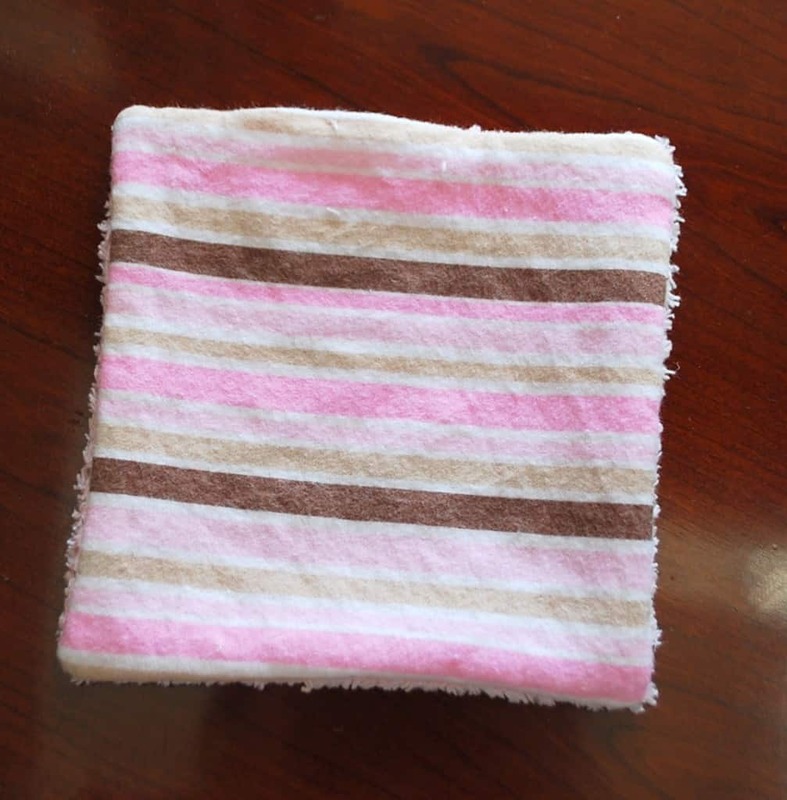 Chenille backed baby washcloths. I think they would make a wonderful baby shower gift. After I posted the tutorial, one reader told me that she actually made some for herself. What a fabulous idea! Can’t believe I didn’t think of it myself. They would be perfect for make-up removal. So if you don’t have a baby, feel free to make some for yourself. First you need to pick two coordinating fabrics. I used flannel on one side and chenille on the other. 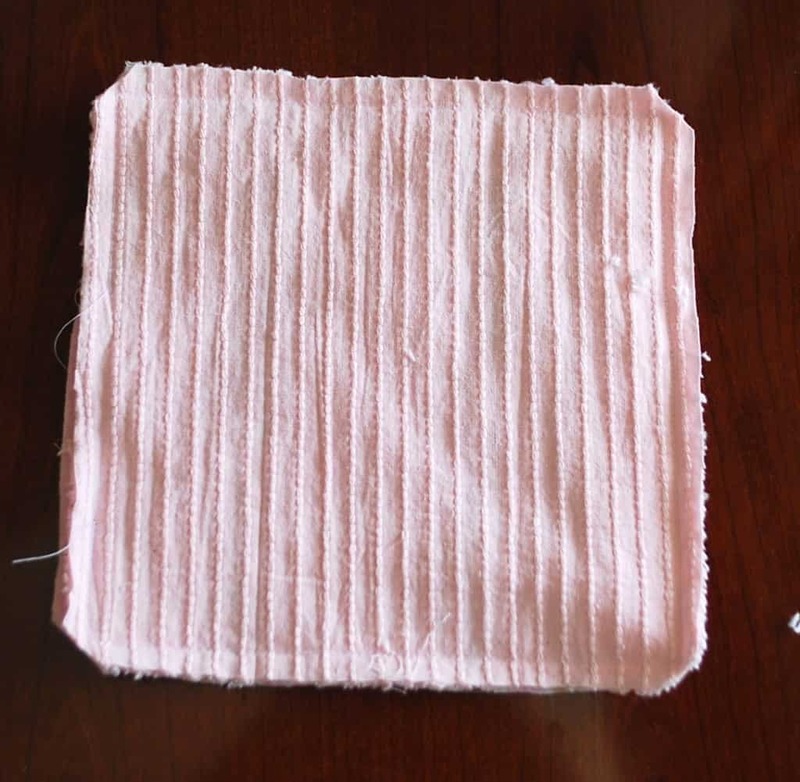 Place the two fabrics right side together and cut a square. I cute mine about 7″. Pin the squares together. You see that space on the left in between the red and blue pins? You are going to leave that open so you can turn the washcloth right side out. Now sew the squares together, using a 1/2″ seam allowance. Don’t forget to leave that space I talked about open! When you’re finished sewing, clip the corners. Now turn it right side out. Now you’re going to sew a stitch all the way around the edge. This will not only sew the hole closed, it will make the whole thing more sturdy. 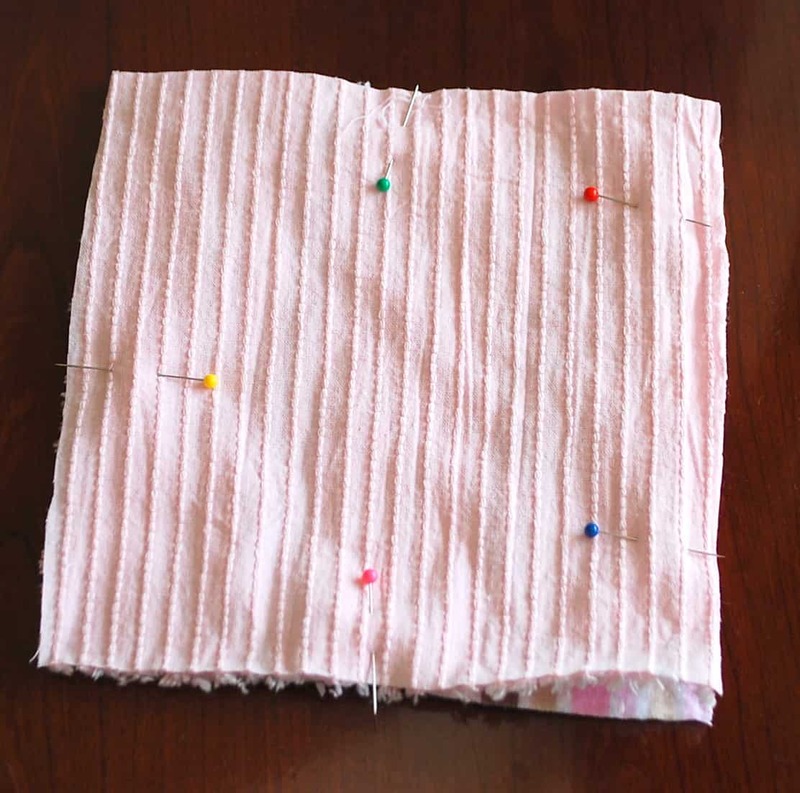 Before you start stitching, make sure the pieces of fabric at the opening are tucked in to the inside evenly. You can iron the opening if you want, but you don’t have to. I sewed as close to the edge as I could get. Stitch up a few of them and you have a great baby shower gift. Wouldn’t they be perfect tucked in a cute basket with bath supplies? I have yards of white terry cloth fabric. That would work for one side too – right? Aw, thanks so much for your kind comment. Sounds like you have a wonderful family, and I think it is amazing that you are sewing for your great grandbabies. I hope I am still able to sew when I have great grandchildren! 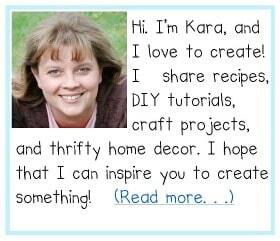 Hi KARA, I have a quick question, where did you find your chenille? I have been all over Asheville N.C. looking for some to no avail. I just found mine at my local Joann fabric. I bet you can buy it online from their website. (joann.com) Good luck! Congrats to your friend! Rainbow babies are such a blessing! 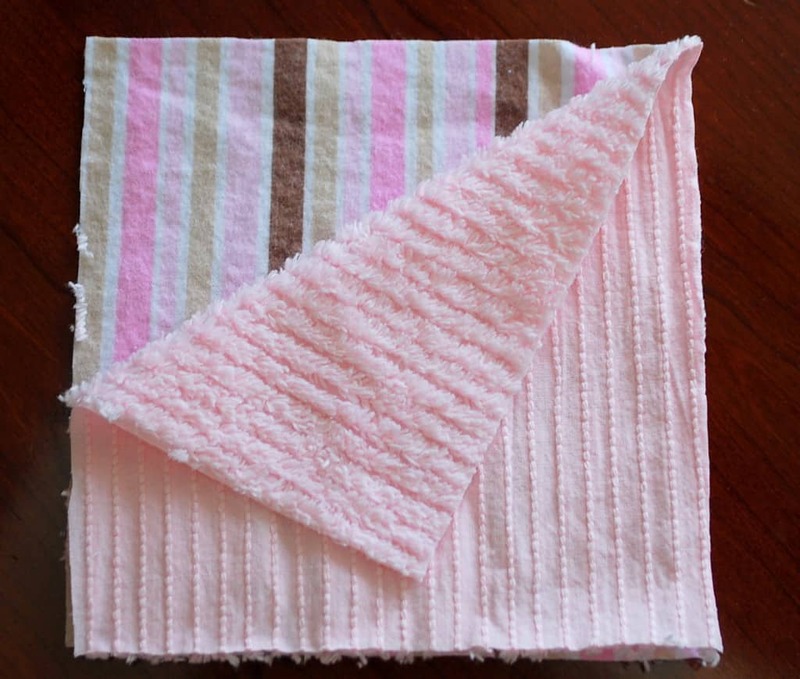 Burp cloths and washcloths are one of my favorite baby gifts to give, I bet she will love them! Wow! I just found this! I was getting ready to buy washcloths for my grandson (we watch him 2 days a week) now that he is eating cereal and fruit/veggies. He NEEDS a good wipe down after eating! I had some left over flannel and way too much chenille! Boom, banged one of these out in NO time! I still struggle, no matter how many pins I use, with the chenille moving any other fabric I put with it, but this soft, adorable wash cloth still came out great! (If anyone has any tips on keeping those fabrics together, I’d appreciate knowing the secret!) Anyway, thanks for posting this! 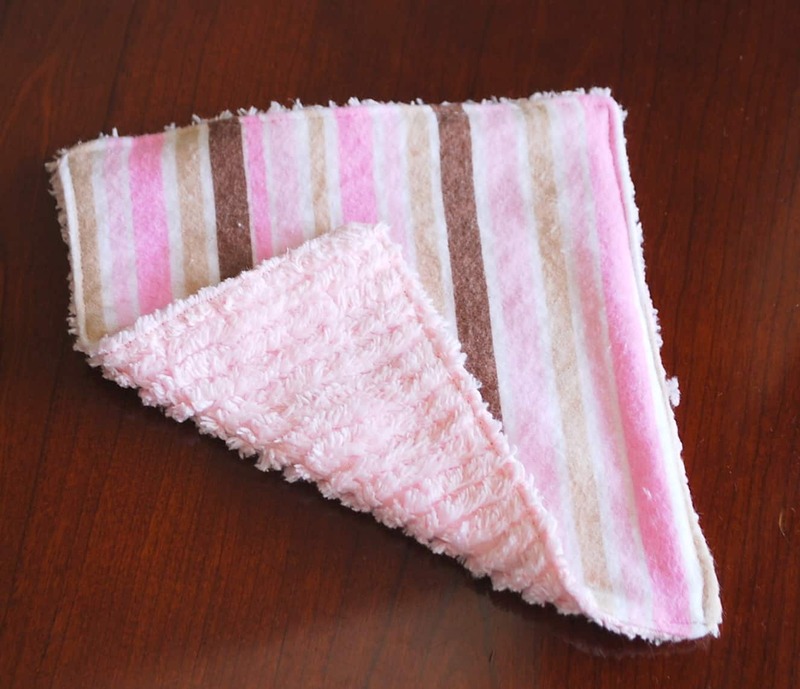 Love these, I make a similar washcloth using minky for both sides.When the grands come to spend the night, they have their own washcloths and ask for them every time. hah. Before sewing the two sides together I mongrammed their nicknames on them. A little fancy but fun. am getting know-how daily by reading such nice articles. this is AWESOME 🙂 i just found your blog!!! 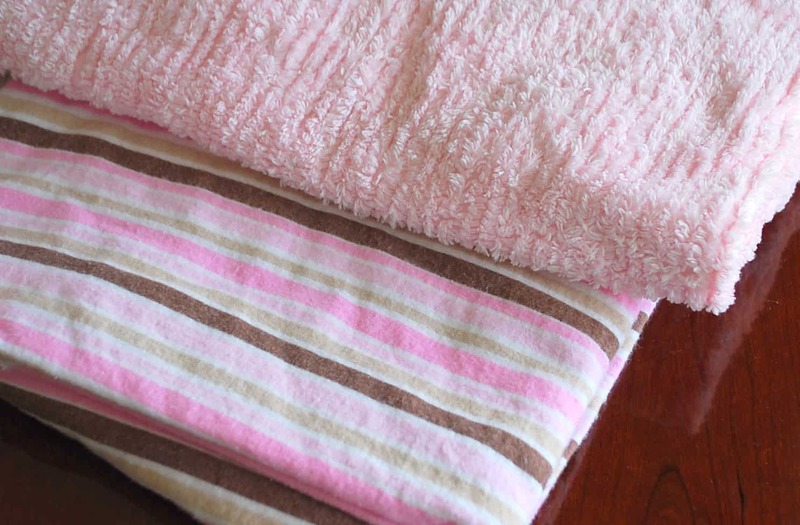 I cloth diaper & have made washclothes similar to these (to use as wipes) with flannel (recycled receiving blankets) and terry cloth (recycled towels) but i never thought about the chenille 🙂 DEF going to try it! I like them so much I’ve actually got plans to make some for myself. I like them better than washcloths, and they are so much cheaper! 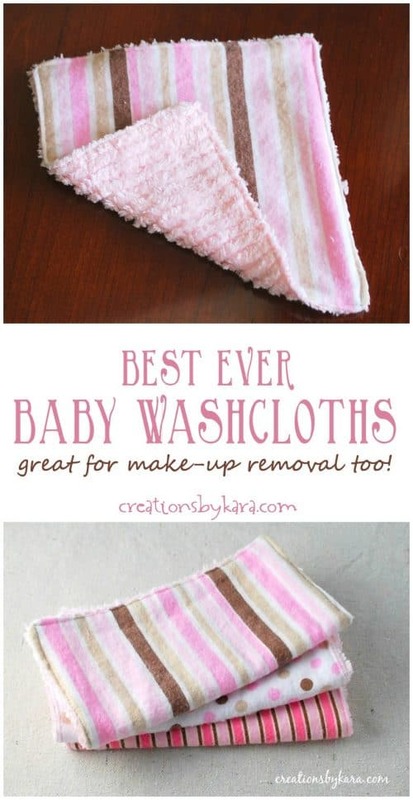 Just a note to let you know that I featured your baby washcloth tutorial in my Save. Craft. Give. post this week. Hello! I love this pattern!! Thanks so much for sharing. My 3rd grandbaby is due in December and I’m looking for quick and easy patterns. I’ve shared this link on my website: http://couponscraftsandcauses.com/crafts/craft-site-links/. Just sharing the link to my post about your tutorial. The Baby Shower was Sunday, and let me just say, the washcloths were a HUGE HIT! Everyone went crazy for them. Thanks again, and I hope you have a few minutes to check them out. Have a great day! I love your project so much I featured it this week! I must try to make some of these for my grand daughter and maybe a few for me! Thanks for the idea! They would be perfect and so soft! And so cute. I love these! My bonus daughter is due next month, so I’m going to make her some of these! Thanks for the inspiration!!! I love these! My bonus daughter is due next month…I’m going to make some of these for her! Thanks for the inspiration!